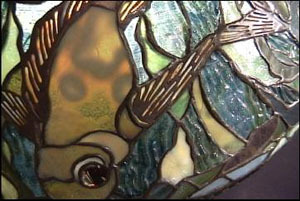 This shade appeared in Fontaine's August Auction 2002. 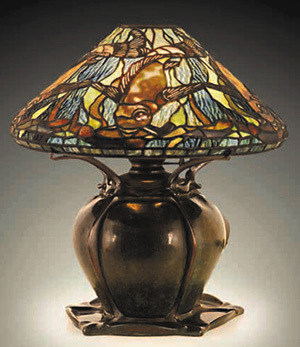 A rare and fine Tiffany favrile and bronze fish lamp on a blown metal pumpkin base. 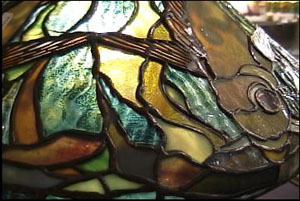 The shade is impressed Tiffany Studios with the early small tags. 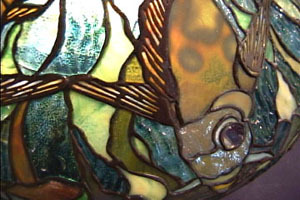 16" diameter shade, Height 17.5 ". ©2002, Colin Hansford, all rights reserved.